Plot: Max's life is perfect. He has a mixed batch of kooky friends, a place to call home and most importantly he is adored by his owner Katie. But Perfection comes to an abrupt halt when shaggy mongrel Duke comes bounding in into his life. Max's world slides off balance and he is thrust on a dangerous quest that takes him far from home with the one canine he loathes. Duke. The two must brave poisonous snakes, dog nabbers and a crazy bunny in order to make it back home to Katie by the end of the day. An old idea with a gut-tickling new twist. The Secret Life of Pets is a firecracker of a film that will have you in stiches. On the fast track to becoming as lovable as Minions, The Secret Life of Pets is one of those triple-threat movies that hits you with the cuteness factor, grips you with a solid story and keeps you hanging on for more laughs. True, it’s not a brand new concept. Threatening outsider encroaches on the underdogs turf. The later resulting in an alpha male power struggle before our protagonists are thrust into unlikely circumstances that encourages a blossoming friendship. Buzz and Woody 2.0. However, it’s the way the movie is put together that works. It’s clever, witty and multi-layered without being too complex. That’s not to say TSLOP lacks complete originality. Let’s face it, how many films can boast of an underground anti-human organisation run by an insane bunny with abandonment issues? Though come to think about it, there is something very Animal Farm-esque about it. 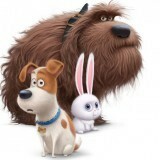 Kevin Hart’s OTT, slapstick comedy style of acting blends well with Snowball’s (the bunny) sadistic streak. Hart really owns the character bringing a delight to its unhinged persona. But it’s Gidget (Jenny Slate) who really steals the show. Driven by her deep infatuation for Max, the naïve, spoilt pet is willing to brave the big bad streets of Manhattan to rescue her beloved. After all, what’s a deranged bunny or a loyal thuggish pig when it comes to love? Lenard, the elegant, sophisticated poodle with a passion for heavy metal is another gem to watch out for. With several pockets of amusement scattered throughout an entertaining plot, directors Chris Renaud and Yarrow Cheney do a great job at ensuring they’re perfectly placed. 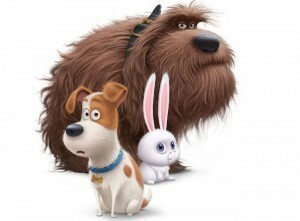 The Secret Life of Pets is a stunning film, full of personality and fun. If there is only one gripe to be had it is with the lack of originality but, hey, what storyline hasn’t been repurposed these days.